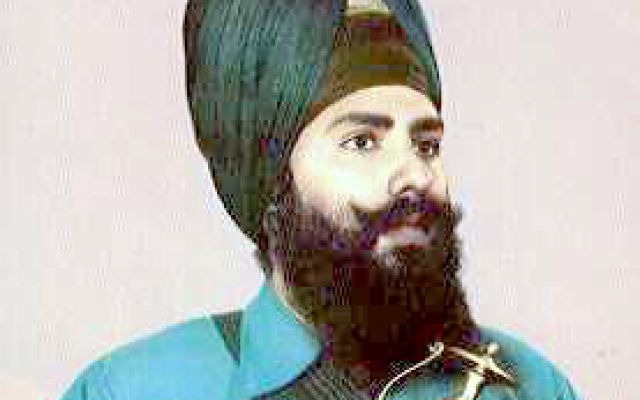 Jathedar Talwinder Singh was born at village Panchhat (tehsil Phagwara, district Kapurthala). After passing his matriculation examination from the village school, he started cultivating his land. In 1970, he migrated to Canada. After getting Amrit, Jathedar Talwinder Singh started missionary activities. His first act was to stop the sale of Guru Granth Sahib as an ordinary book in Canada. Later, he undertook the mission of elimination of un-Sikh like practices from the Gurdwaras in Canada. He, along with his friends, had to struggle hard to stop the entry of bare-headed people into the worship halls of the Gurdwaras. After the killing 13 Sikhs, by the Nirankari cult, at Amritsar, on April 13, 1978, he went to Punjab and organized the Sikh youth. His organization punished those who were guilty of blasphemy and sacrilege of the Sikh shrines and/or leaders of anti-Sikh Mafia gangs. For some months the Government could not know anything about the organization. In November 1981, the Government was able to identify the leaders of the organization. Jathedar Talwinder escaped arrest. In 1982, he returned to Canada via Nepal and Thailand. He continued his activities in the Western Hemisphere. As a result of conspiracy of one of his colleagues (Satnam Singh Babbar of Germany), he was arrested on June 29, 1983, while entering Germany. He had to undergo a hunger strike to win his right to turban and vegetarian meals in Düsseldorf jail (Germany). In June 1984, he was released unconditionally. He was arrested again, in Canada, in November 1985, in connection with the blasting of an Indian airliner. Here too, he was acquitted in April 1986. He was arrested again, in May 1986. He remained in jail till April 14, 1987. Here too, he had to undergo hunger strike for right to vegetarian meals. After some time he left Canada to join the Sikh army. He participated in several expedition and actions. In October 1992, he was arrested at Jammu and was mercilessly tortured. He was killed in a fake encounter, on October 15, 1992 at village Kang Araian (district Jullundur).